Getting older is a fact of life and something I have come to accept. I still feel like a teen sometimes, even though I am now in my early 30s. I’d like to stay looking younger as long as I can by natural means…no surgery for me that’s for sure! 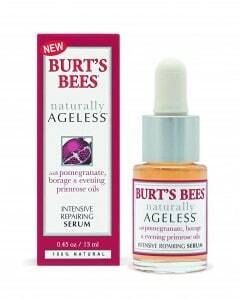 Burt’s Bees has been one of my favourite brands for some time now so when I heard about their new Naturally Ageless Collection, I just had to see what it was all about! Burt’s Bees Naturally Ageless Collection are natural products designed to reduce wrinkles and lines and improve the firmness of your skin. They are made with pomegranates and their anti-oxidant power as well as other natural ingredients. Plus, it has no Dimethicone which is in other aging products and may pose a risk to people. 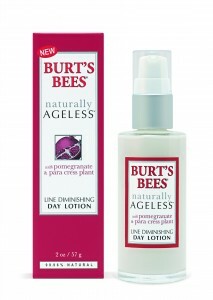 I tried Burt’s Bees Naturally Ageless Skin Firming Night Creme. Its goal is to fight the signs of aging while you sleep and restore your skin’s firmness. It contains Pomegranate (fights free radicals), White Birch Bark (restores elasticity and firmness) and Para Cress Plant (diminishes fine lines and wrinkles). I always wash my face before bed so I applied the night creme to my clean face. I liked that it absorbed well into my skin and wasn’t greasy. I also didn’t need to use much as a little went a long way. The smell is amazing! It’s like a fruity smell which is probably the pomegranates. I thought it smelled a little like apples! My skin is still pretty firm thankfully, but I know that my day is coming so its good to take preventative measures now. 78% of women who used this product said that after 4 weeks of use said their skin felt firmer. I like that it’s natural and I trust Burt’s Bees and believe in their product line. Anyone looking for anti-aging skincare products should give this new collection a try! 9/22 I voted for you. LIPS surround TEETH so I like the Burt’s Bees collection of natural lip balms and creams formulated to heal, repair and moisturize. I also like the lip shimmers and gloss! 9/23 voted for you on Picket Fence Blogs.